Flattering50: Are You Ready for Some Labor Day Sales? Editor's Note: Most, but not all, of the sales reported below ended on Labor Day, Sept. 3rd, 2012. On my way home from work last night, I stopped at the local sporting goods shop to check out its Labor Day Weekend sale. I was looking for a deal on a new tennis outfit (yes, I've got US Open fever!) and found a Lacoste outfit, originally $150 before tax, reduced to just $58 after tax. Eureka!! This very happy over 50 woman recommends you check out the sales at your favorite online and on-the-street shops this holiday weekend. Clothiers are offering up to 75% off. While some of the biggest savings are on summer items, there are discounts on new fall fashions, too. For instance, you'll find the Pure Collection Fall - 25% Off . All the latest styles are reduced--I like that! The Animal Print Pencil Skirt (above), which is regularly $124, is $93 right now. Click "read more" for other sales and a few garments and accessories that could make you a happy over 50 woman this weekend. Where to begin? I'll start with Nine West. The shoe store is giving an additional 25% off selected styles till Sept. 3rd. But wait. NW also has drastically reduced the prices on handbags. Take, for instance, Nine West Gusty Tote Tote ($119, reduced to $59 with additional 25% off at checkout). Click on the picture to see how roomy this tote is, making it a great weekend bag! Need shoes? Easy Spirit has a variety of offers right now, including 25% off new arrivals till 9/9. Easy Spirit Precia Comfortable shoes for women (was $79, now $39) with a 2" heel. Also available in Black and Off-White. It's a great time to circle back to garments you saw and loved earlier in the season, but couldn't quite afford at the regular price. You may luck out and find the piece on sale this weekend. For example, you'll find 25% off everything at Anne Klein through Sept. 3rd. That means the Anne Klein Tonal Print Knit Cardigan , which was $89, is now $39 with additional 25% off at checkout. If you can see beyond the youngster wearing this cardigan, I think you'll agree it's a great piece. It's got everything I love in a garment for women over 50--a sophisticated print, neutral color, lightweight material, and feminine draping below the hips. Last winter, I bought the puffy coat below during a 30% off sale. I love this coat. It kept me warm all winter, especially on those windy Manhattan avenues. And the trim design--not too boxy or puffy--kept me from looking like a walking air mattress. I felt like a smart shopper because I got 30% off on a quality garment last December. But this weekend, you'll find up to 75% off hundreds of already reduced items at Jones New York. Sale Ends Sept. 3rd. Jones New York Quilted Puffer Coat (was $249, now $69 plus an additional 25% off at checkout) in Sizes S-XL. Also available in brown in Sizes M and L.
Sales aren't always about giving clothing and accessories away for cheap. Sometimes, a sale can take an expensive garment or accessory and put it just within reach. I don't look at designer clothing unless it's on sale. Right now, you'll find up 70% off selected styles at Shopbop. Click the Shopbop promo box in left-hand margin of Flattering50. Shopbop specializes in designer fashions. 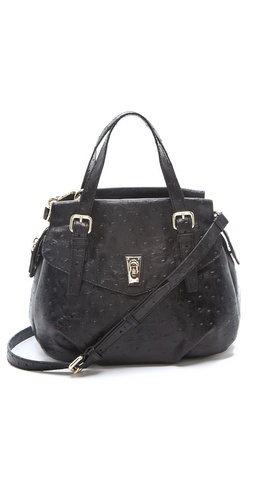 So I went on the site and found this beautiful Marc by Marc Jacobs Intergalocktic Ozzie Nova Bag (was $378, now $264.60).